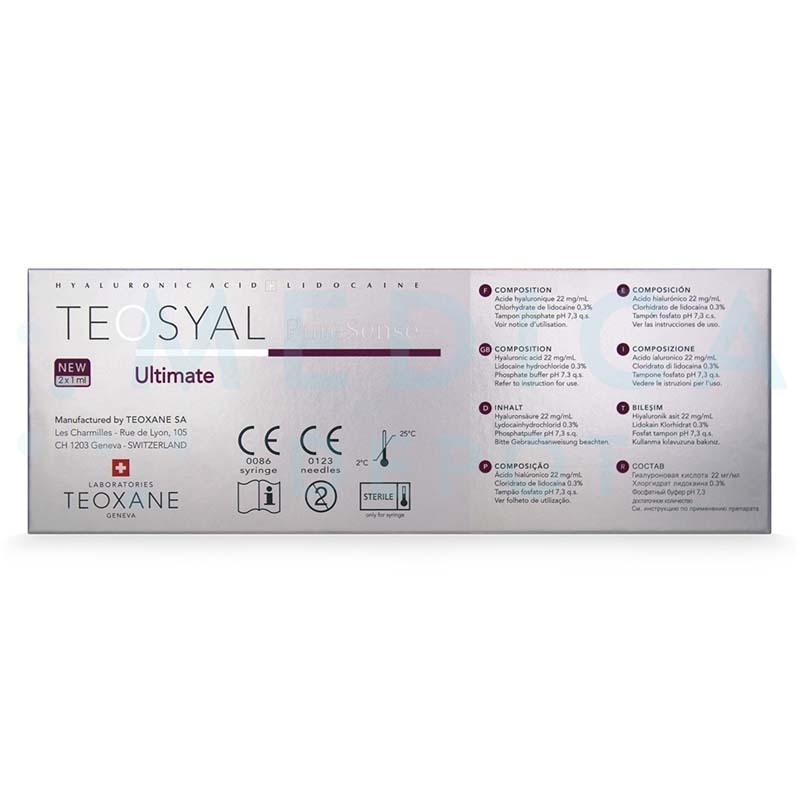 Dermal Fillers Teosyal® TEOSYAL® PURESENSE ULTIMATE 2x1mL. 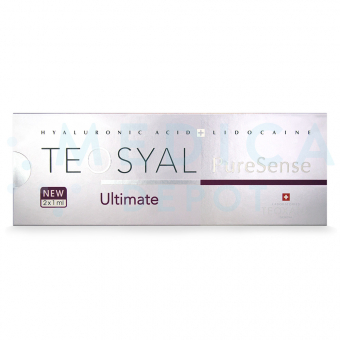 What is Teosyal PureSense Ultimate 2-1ml? 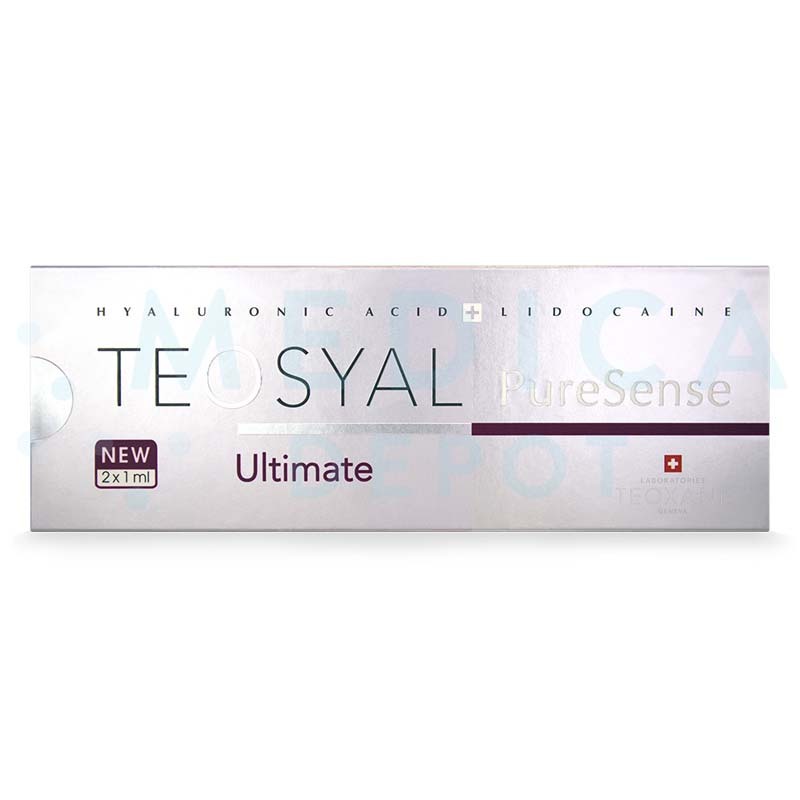 Teosyal PureSense Ultimate 2-1ml is an injectable gel containing pure, homogeneous, monophasic, and non-animal hyaluronic acid, with lidocaine added for pain reduction. It is suitable for injection into the sub-dermal layer to fill deep skin depressions, sculpt facial features, or restore or augment volume in the cheeks and chin. Results of this treatment may last for about 18 months. 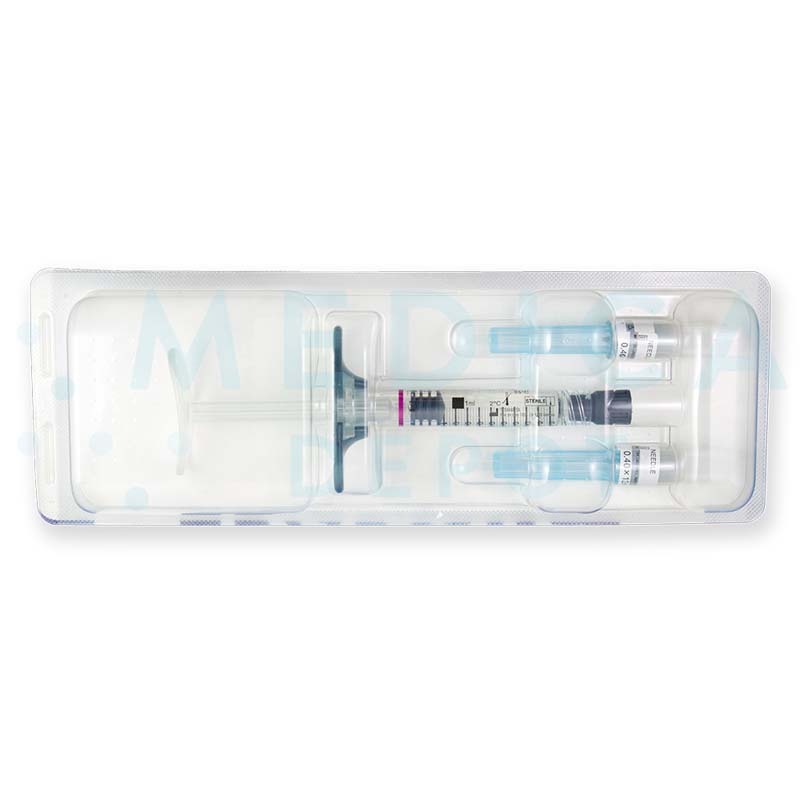 You may order this product online from MedicaDepot.com, or you purchase this and other dermal fillers from our helpful customer care associates via phone. When you buy wholesale Teosyal PureSense Ultimate 2-1ml from Medica Depot, you can help your patients sculpt their facial features for a smooth, contoured appearance. Like many dermal fillers, Teosyal PureSense Ultimate 2-1ml is made of hyaluronic acid. However, the hyaluronic acid in Teosyal PureSense Ultimate is pure, homogenous, and monophasic, allowing it to provide natural-looking results while giving stable volume to the dermis. This formula also contains lidocaine, which provides added comfort to patients. As you inject Teosyal PureSense Ultimate into the skin, its hyaluronic acid adds instant cushioning and hydration. This is because this substance has an innate ability to bind with water molecules in the dermis, holding up to 1000 times its weight in moisture. This enhances volume levels within the skin, which may work to fill deep skin depressions, or restore or add volume to the cheeks and chin. Furthermore, its lidocaine content reduces sensations of pain, its anesthetic power providing relief and comfort to patients during the injection process. This formula includes cross-linked hyaluronic acid, lidocaine hydrochloride, and a phosphate buffer. This product is administered via injection into the subcutaneous tissue or pre-periosteal areas of the face, depending on the treatment area and application. Each treatment should be performed using a 27G½” hypodermic needle, which is supplied with this product. If preferred, a round cannula with side holes may be used instead. For full instructions, please consult the product pamphlet. This product should be used to correct facial volume loss due to age. This can be done in 1 or 2 injection sessions. To maintain the desired corrections, patients should undergo touch-up sessions every 2 years or as necessary. What areas can I treat with this product? With its intense volumizing formula, Teosyal PureSense Ultimate 2-1ml may be used to add or restore volume to facial features such as the cheeks and chin, or to correct deep skin depressions. 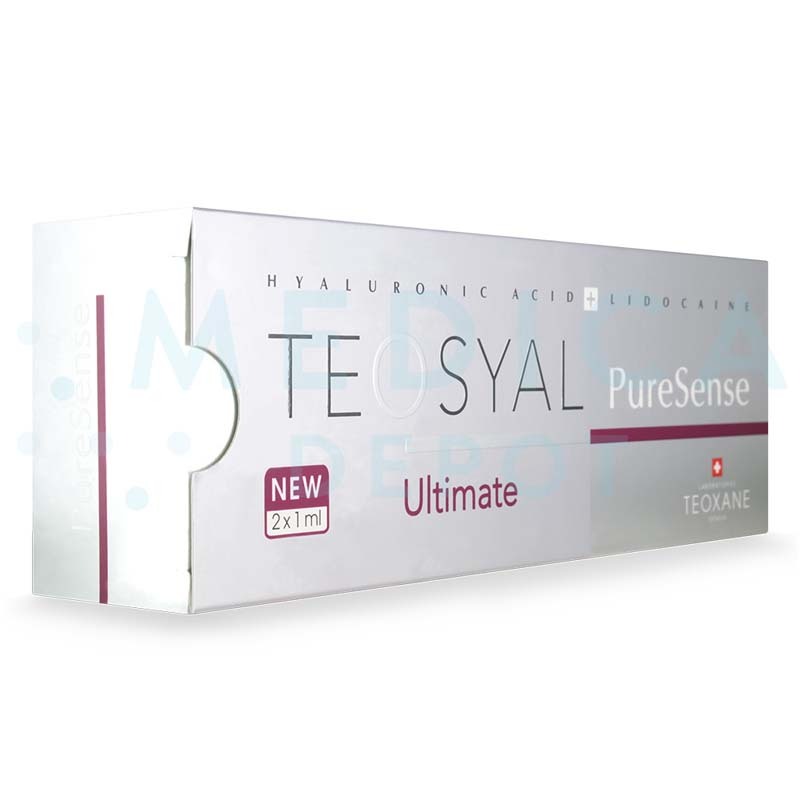 Teosyal PureSense Ultimate 2-1ml is one of the longest-lasting dermal fillers on the market. This is thanks to its pure, monophasic, homogeneous hyaluronic acid gel, which resists degradation within the body. Patients who receive Teosyal PureSense Ultimate injections find their results can last up to 18 months, giving them a long while to enjoy their newly sculpted facial features. Potential candidates for this treatment are individuals who require volume restoration in large amounts for intensive facial remodeling. These may be for the purposes of sculpting the cheeks and chin, or to fill deep and severe skin depressions. Medical professionals can benefit greatly from adding Teosyal PureSense Ultimate 2x1ml to their aesthetic treatments, as its effects are well tolerated and long-lasting. Purchase wholesale Teosyal PureSense Ultimate 2x1ml from Medica Depot to help your patients sculpt their facial features with intense volume. Common side effects of these injections include erythema or redness, discomfort, and swelling at the injection site, although these issues generally resolve quickly. Patients should not be treated with this product if have a hypersensitivity to hyaluronic acid or lidocaine, a history of anaphylaxis, or other severe allergies. Pregnant and breastfeeding women, as well as individuals under the age of 18, should not receive dermal filler injections. Should your patients experience any adverse effects, a medical professional should be contacted immediately.